(Trent Nelson | The Salt Lake Tribune) Members of the USOC visited Salt Lake City on Wednesday Nov. 14, 2018, including a stop for lunch at Rice-Eccles Stadium. (Trent Nelson | The Salt Lake Tribune) Jeff Robbins of the Utah Sports Commission speaks at a luncheon at Rice-Eccles Stadium during a visit to Salt Lake City on Wednesday Nov. 14, 2018. (Trent Nelson | The Salt Lake Tribune) Governor Gary Herbert speaks at a luncheon at Rice-Eccles Stadium during a visit by the USOC to Salt Lake City on Wednesday Nov. 14, 2018. (Trent Nelson | The Salt Lake Tribune) USOC CEO Sarah Hirshland speaks at a luncheon at Rice-Eccles Stadium during a visit to Salt Lake City on Wednesday Nov. 14, 2018. (Trent Nelson | The Salt Lake Tribune) USOC CEO Sarah Hirshland, right, speaks with Jackie Biskupski, Gary Herbert, and Spence Eccles at a luncheon at Rice-Eccles Stadium during a visit to Salt Lake City on Wednesday Nov. 14, 2018. (Trent Nelson | The Salt Lake Tribune) Salt Lake City Mayor Jackie Biskupski speaks at a luncheon at Rice-Eccles Stadium during a visit to Salt Lake City on Wednesday Nov. 14, 2018. (Trent Nelson | The Salt Lake Tribune) USOC CEO Sarah Hirshland speaks with Gary Herbert at a luncheon at Rice-Eccles Stadium during a visit to Salt Lake City on Wednesday Nov. 14, 2018. (Trent Nelson | The Salt Lake Tribune) Olympic medalist Shannon Bahrke speaks at a luncheon at Rice-Eccles Stadium during a visit by the USOC to Salt Lake City on Wednesday Nov. 14, 2018. (Trent Nelson | The Salt Lake Tribune) Olympic medalist Shannon Bahrke speaks at a luncheon at Rice-Eccles Stadium during a visit by the USOC to Salt Lake City on Wednesday Nov. 14, 2018. (Trent Nelson | The Salt Lake Tribune) USOC CEO Sarah Hirshland gets a standing ovation in the House Chamber as the Utah House and Senate welcomed members of the USOC, who were visiting Salt Lake City on Wednesday Nov. 14, 2018. (Trent Nelson | The Salt Lake Tribune) David Koch's painting, Engen Brothers Bring Skiing to Utah in the House Chamber. The Utah House and Senate welcomed members of the USOC, who were visiting Salt Lake City on Wednesday Nov. 14, 2018. (Trent Nelson | The Salt Lake Tribune) USOC CEO Sarah Hirshland speaks in the House Chamber as the Utah House and Senate welcomed members of the USOC, who were visiting Salt Lake City on Wednesday Nov. 14, 2018. (Trent Nelson | The Salt Lake Tribune) USOC CEO Sarah Hirshland speaks in the House Chamber as the Utah House and Senate welcomed members of the USOC, who were visiting Salt Lake City on Wednesday Nov. 14, 2018. (Trent Nelson | The Salt Lake Tribune) Rep. Brad Wilson, R-Layton, speaks as the Utah House and Senate welcomed members of the USOC, who were visiting Salt Lake City on Wednesday Nov. 14, 2018. i(Trent Nelson | The Salt Lake Tribune) Sen. Stuart Adams, R-Layton, embraces Utah Sports Commission President and CEO Jeff Robbins in the House Chamber as the Utah House and Senate welcomed members of the USOC, who were visiting Salt Lake City on Wednesday Nov. 14, 2018. At rear is House Speaker Greg Hughes. Left to right, Robbins, Adams, House Speaker Greg Hughes, Senate President Wayne L. Niederhauser. (Trent Nelson | The Salt Lake Tribune) USOC CEO Sarah Hirshland speaks in the House Chamber as the Utah House and Senate welcomed members of the USOC, who were visiting Salt Lake City on Wednesday Nov. 14, 2018. i(Trent Nelson | The Salt Lake Tribune) Sen. Stuart Adams, R-Layton, speaks as he Utah House and Senate welcomed members of the USOC, who were visiting Salt Lake City on Wednesday Nov. 14, 2018. At rear is House Speaker Greg Hughes. (Trent Nelson | The Salt Lake Tribune) House Speaker Greg Hughes speaks as the Utah House and Senate welcomed members of the USOC, who were visiting Salt Lake City on Wednesday Nov. 14, 2018. (Trent Nelson | The Salt Lake Tribune) USOC CEO Sarah Hirshland gets a standing ovation in the House Chamber as the Utah House and Senate welcomed members of the USOC, who were visiting Salt Lake City on Wednesday Nov. 14, 2018. (Trent Nelson | The Salt Lake Tribune) Rep. Francis Gibon, R-Mapleton, holds up an Olympic torch in the House Chamber as the Utah House and Senate welcomed members of the USOC, who were visiting Salt Lake City on Wednesday Nov. 14, 2018. After all the meetings and news conferences, all the lengthy discussions and all the endless what-ifs that have accompanied the past six years since Salt Lake City and Utah made it known that an Olympic return would not only be possible but also welcomed, the United States Olympic Committee arrived for a one-day visit. Yeah, the dream sequel, it appears, is very much in play. The full-day docket began with a stop at the Utah Olympic Oval in Kearns, where less than a week ago, the ISU short-track speedskating World Cup returned for what’s become an annual stopover. In the coming months, the oval will host a long-track World Cup event, too. On the scoreboard beyond the rink, it read, “Welcome United States Olympic Committee.” Next to the scoreboard still sit the five Olympic rings. 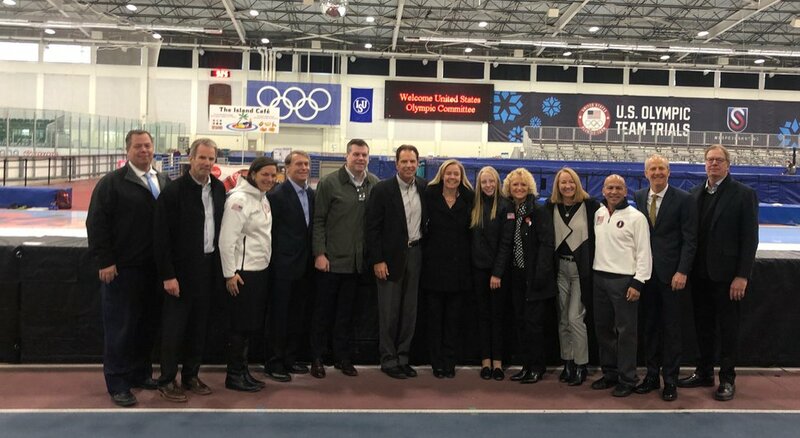 Photo courtesy Brett Sterret: Utah officials and members of the United States Olympic Committee pose for a photo at the Utah Olympic Oval in Kearns Wednesday morning during the USOC's on-site visit. 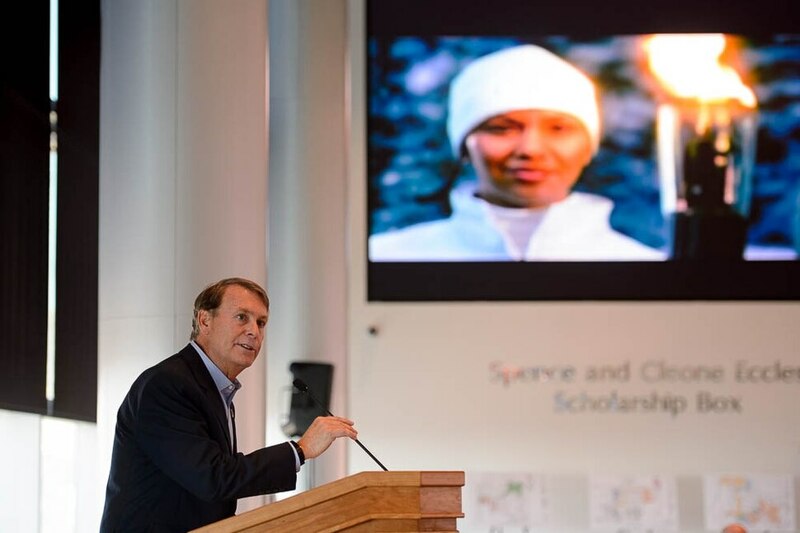 Hirshland was accompanied by USOC Chairman Larry Probst, chief external affairs officer Patrick Sandusky, board member and chairwoman-elect Suzanne Lyons and USOC chief bid officer Christopher Sullivan, all of whom headlined the visiting group. Sandusky took to Twitter on Wednesday to post varying updates of both Denver and Salt Lake City. Utah officials showed off the 2002 Olympic venues still as active as ever, still part of respective World Cup and World Championship calendars each winter. The group stopped in Park City to check out the Utah Olympic Park, home to the ski jumps and bobsled, skeleton and luge track. 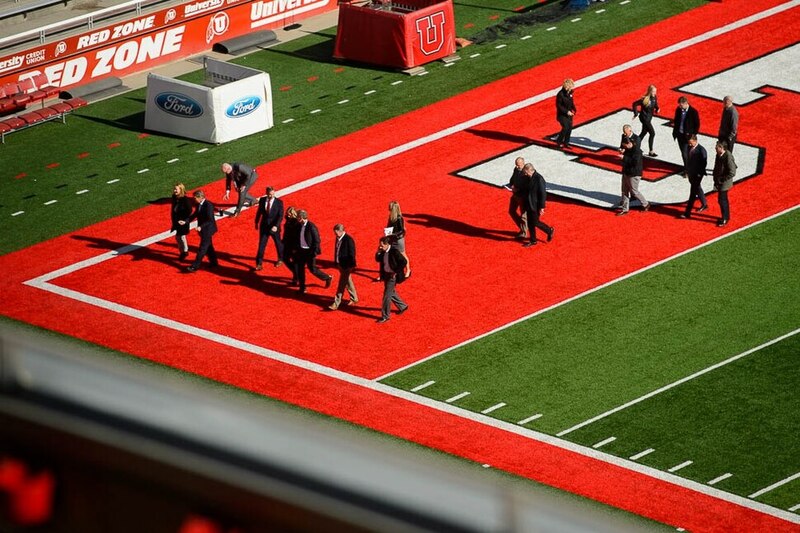 One of the stops in the afternoon included Rice-Eccles Stadium, where just hours earlier, the University of Utah held a news conference to announce progress toward an $80 million bond for expansion of the stadium that hosted the 2002 Opening and Closing ceremonies. The state pulled out all the stops in what Hirshland described as a jampacked 12-hour visit. On Wednesday afternoon, a rare joint meeting of the state Senate and House took place, where politicians welcomed the USOC. 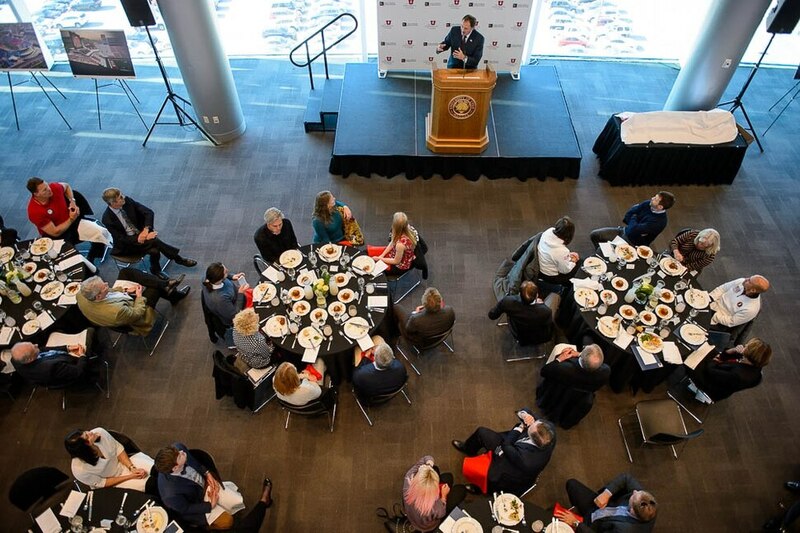 Hirshland briefly addressed the lawmakers, saying the consensus after talking to local officials, athletes, volunteers and philanthropists alike was that the Utahns asked the USOC CEO: “Let us prove it.” Hirshland was greeted by a standing ovation on the floor of the House chambers. The USOC’s field was whittled down to two earlier this week when Reno-Tahoe declined to continue to be part of the bid process, citing financial constraints. That left Salt Lake City and Denver as the USOC’s final options for what is expected to be a bid for the 2030 Winter Olympics. The USOC is expected to decide on a bid city in December, likely at its final board of directors meeting of 2018. Meanwhile, the International Olympic Committee (IOC) saw another potential 2026 host say thanks, but no thanks on Tuesday evening. Calgary saw 56 percent of voters oppose a bid. That now leaves Stockholm, Sweden, and Milan, Italy, as the last standing potential cities for the 2026 Winter Games. Salt Lake City continues to be floated by those who cover the IOC and the Olympics as a potential last-ditch effort for 2026, should any more bid cities decide to exit the process. The Denver Post reported Tuesday that Denver’s organizing group believes an Olympics based in that city could privately finance a Games for anywhere from $1.8 billion to $2.1 billion. There is, however, a contingent that is collecting signatures for a “Let Denver Vote” campaign. Should it make the ballot in May, it would require Denver to get voter approval before spending money or resources to support a future Olympics. A report from Utah officials earlier this year stated that another Olympics here would cost around $1.29 billion — less than the 2002 Olympics. Gov. Gary Herbert said Wednesday that the Games would involve public as well as private funding. Recent polls taken statewide had projections that as high as 89 percent of Utahns would support another Olympics in Utah. Salt Lake City Mayor Jackie Biskupski lauded the city’s and state’s readiness. She said the ongoing airport renovation is expected to be finished by 2024, adding that it will be the only brand-new international airport in the country at that time. During the luncheon, she bragged that she sometimes still wears her 2002 Olympic jacket, the way several of those associated with the Games 16 years ago still do. Jeff Robbins, president of the Utah Sports Commission, pointed out that Biskupski wore a Cammi Granato hockey jersey to a recent Olympic meeting, a throwback to the U.S. hockey star who won silver at the 2002 Games in Salt Lake City. Biskupski said it was rewarding to see firsthand the USOC officials soak in the legacy that Utah has established since the Olympic Cauldron was extinguished in 2002. She pointed beyond the venues still in place to the state’s investment in athlete housing in the valley and Park City as another reason why Salt Lake City will always be a place synonymous with the Games. Will the next generation have a shot at competing here in an Olympics in the faraway future?